Prev Pop Tunes Big Rocker Drum Set Next Happy Pi Day: let’s celebrate with some PIE! 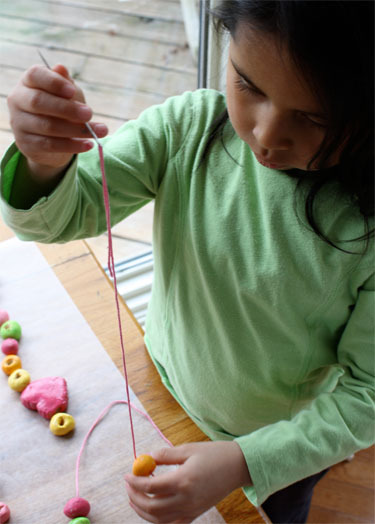 To make these special beads for St. Patrick’s Day and Spring… mix up some flour, salt, oil and water. * Mix well and knead with hands. 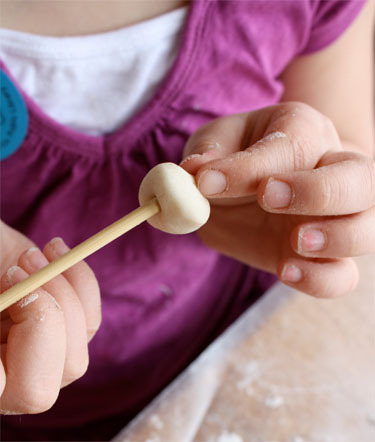 Begin making beads by rolling small pieces of dough between hands. Use a skewer to make a hole in the middle of the bead. Make the holes really large. 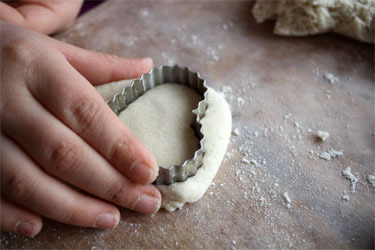 The dough will shrink during baking. Cookie Cutters can be used to make pendants for the necklaces. 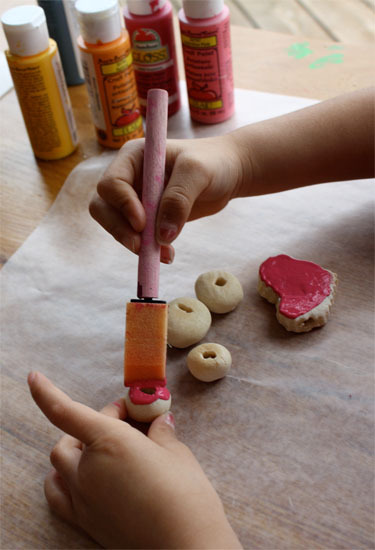 To make the shamrock cut out three small hearts, press together and then add a piece of dough for the stem. Once all the beads are made they need to be baked. Bake beads and pendants at 300 degrees for about an hour (turning once). 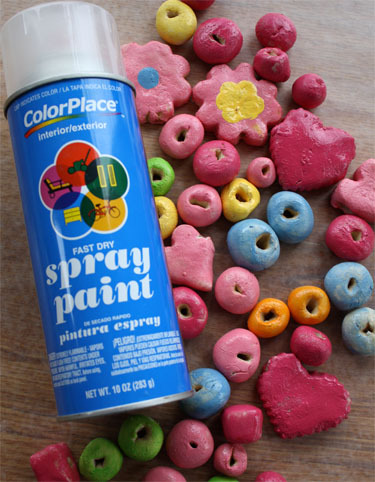 Once the paint has dried, give the beads a coat of clear spray paint. 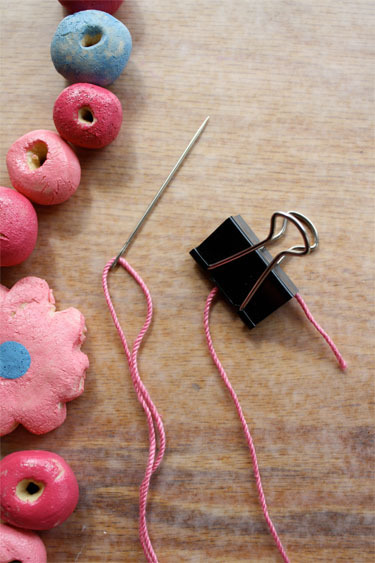 Use a yarn needle to thread the beads onto crochet thread (what we used), embroidery floss or yarn. Placing a clip on the end will keep the beads from slipping off the end while stringing. Carefully thread the beads onto the thread. We used this opportunity to talk about pattern and symmetry. 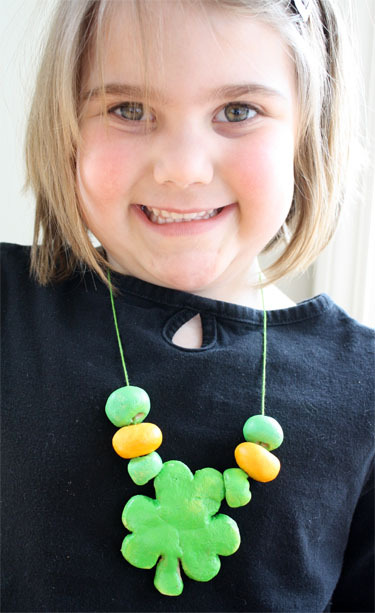 Place necklace around neck and tie in the back. Now you have some bling for spring too! Love it! Will try it with the girls this weekend. That is so fun! I am going to have with that next week during spring break! How cute! Love the craft! That is soooo cute. 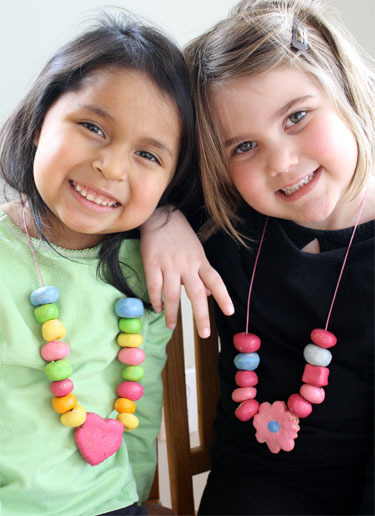 I have 4 girls and they would love to make these. Thanks for sharing. I am visiting from “skip to my lou”…and i am glad I did. These little necklaces are so cute. And the ones wearing them are adorable! To Joan: The dough will keep for several weeks in a refrigerator. Put it in a plastic bag. Little spots of mold will appear when it is going bad. I just pinch the bad spots off and keep using it. I’m going to make these with my kids. 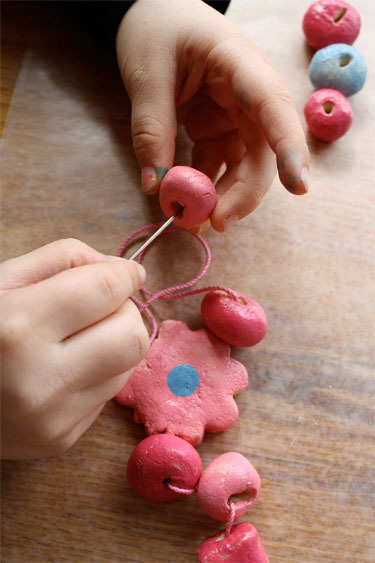 I remember doing something similar with salt dough as a kid. It brings back nice memories! 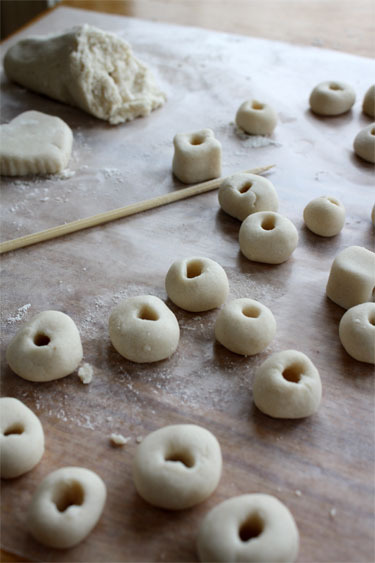 And how simple is the salt dough recipe?! L.O.V.E. I.T. Thank you…. This is a great project! I love the pics too! we do this all the time. we make presents for the grandmothers. make ornaments and just fun things to paint. love the pictures and thee colorful result.